Some distilleries around Seattle now offer Old Fashioneds, Bloody Marys and gin-and-tonics on your visit. Even better, most cocktails are cheaper than those served at bars. At Heritage Distilling Company in Ballard, you can get a rye Old Fashioned or a refreshing bourbon take on a Moscow Mule. Or maybe a Ruby Red grapefruit-vodka libation is more to your liking. But on a recent Saturday, a host had to correct a party on a girls’ night out that this is a tasting room, not a bar. You can see how they would be confused. The hosts here double as mixologists with their own well station and a bevy of bitters, syrups and cocktail mixers. Their cocktails are made with whiskeys, gins and ryes from the pot still that’s plopped on the other side of the glass pane window, a few steps away. Have you been to a craft distillery recently? Some look like cocktail dens, complete with bar stools and cocktail menus. In Lynnwood, Temple Distilling Company’s tasting room may be harder to locate than a speakeasy since it’s hidden in an obscure business complex that doesn’t even have a business directory. But Temple rewards those who make the trek with $5 cocktails from a Red Snapper (Navy Strength gin, Bloody Mary mix, lemon, celery bitters) to a Spring Collins (its limoncello, lavender syrup and soda). In Seattle, Fremont Mischief Distillery, Glass Distillery and Six Spirits also serve cocktails. Farther out, Scratch Distillery in Edmonds, Pursuit Distilling in Enumclaw and Chambers Bay Distillery in the South End do as well. The state liquor board, though, doesn’t want you to get too comfortable. Last year, Washington state amended its law to allow distilleries to serve cocktails but also made sure these tasting rooms don’t become watering holes; the state caps distillery customers to two ounces of booze per day. Cocktails can’t contain more than a half ounce of alcohol. Distilleries often sell a flight of mini cocktails since a full cocktail seems watered down with just a half-ounce of booze. In other cases, cocktails tasted more like two-finger pours. When the Gig Harbor-based Heritage Distilling Company launched in the Seattle market this month, the pomp surrounding its debut in Ballard felt like a cocktail happy hour. Its staff was furiously straining cocktails and straining to be heard above the din. One couple shared a cinnamon-rimmed bourbon drink while nearby, a gal swilled a ruby-red vodka cocktail that was as bright as her ruddy cheeks. Unlike most distilleries housed in warehouse spaces, Heritage aims for the hippest barhopping neighborhoods. Its Ballard spot sits along the commercial drag of Northwest Market Street, and its next distillery expansion is scheduled for July in Capitol Hill by Lark restaurant, two blocks from the Pike/Pine corridor. 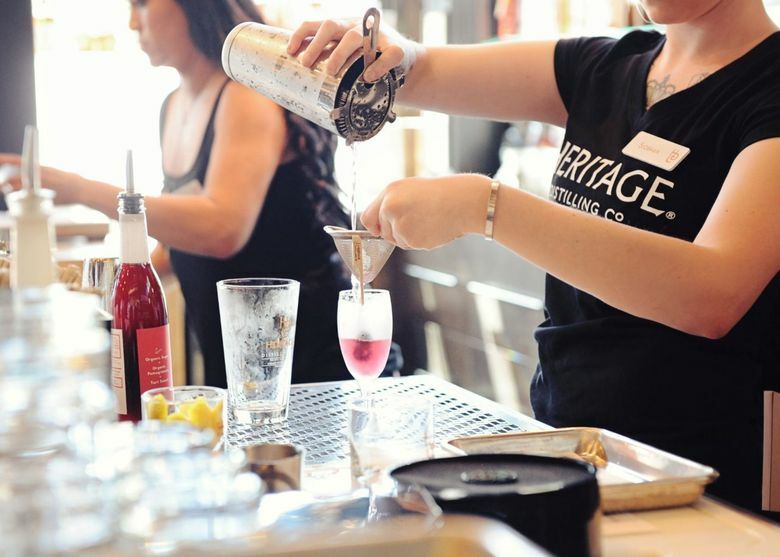 For Heritage, the $5 cocktails allow “us to show people how to use the products in drinks, and they can purchase all the ingredients in our retail area,” said Hannah Hanley, the distillery’s chief marketing and strategy officer.